Harry H George Jr. was born to Elizabeth Kent, who worked for the Philadelphia Inquirer and Harry George sr., a musician who created the TRUJO banjo. In 1938 Harry graduated from Philadelphia’s Overbrook High and while studying at Temple University, went to work for Midvale Steel Company.Wanting to serve his country on the front lines, Harry volunteered and was accepted as a Cadet in the Army Air Corp. After training in Miami Beach/South BeachHarry was promoted to Lieutenant of the Army Air Corps and awarded his flight wings. Harry qualified as a B-29 pilot and began training with Gen Paul Tibbits’elite group at Grand Island, Nebraska. In 1945 he was assigned to the 6th Bomb group of the 20th Army/Air Force and flew 40 combat missions from Tinian island. During a night bombing raid over Tokyo his B-29 the “Anne Gary III” was attacked by Japanese fighters and anti flack. As co-pilot on this mission Harry made his way to the rear of the plane and administered first aid to wounded crew. Somehow he and his crew, managed to fly four hours to the island of Iwo Jima with only two engines running, ruptured gas tanks, bomb bay doors jammed open and seriously damaged landing gear. The crew bailed out over Iwo Jima as the pilot headed the Anne Gary III out to sea and bailed out. He was a hero with a flare for the romantic, after bailing out over the occupied pacific island of Iwo Jima, he scooped up his silk parachute and sent it to his fiancée Gloria Jean Iampieri, a world war II secretary with a top secrete security clearance who was working for the allies lend/lease program in Philadelphia. His note to Gloria was, “make your wedding dress out of this silk, I will be home soon.” She accepted. They were married had a daughter and four sons. After more than twenty years in the Air Force serving during the cold war in the United States, Japan and Turkey, Harry retired. 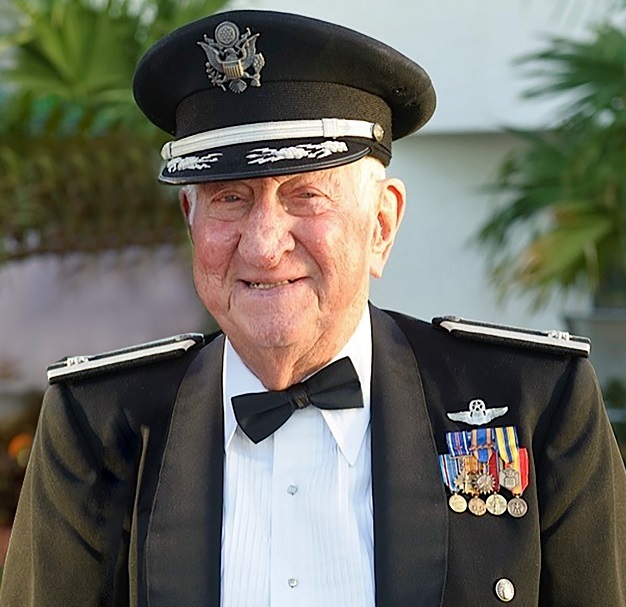 Harry had been awarded the Distinguished Flying Cross with Oak Leaf Cluster, Air Medal with Four Oak Leaf Clusters, Air Force Commendation Medal, Distinguished Unit Citation with Oak Leaf Cluster, Senior Pilot Wings and Command Pilot Wings. In 1967 Harry attended Florida State University, received a degree in education and taught American History and Aeronautics at Northeast High School in St. Petersburg, Florida until 1983. As a senior class sponsor he supported many school events. He enjoyed ballroom dancing with Gloria, the beach and photography. In 1993 after his beloved wife Gloria died, he moved to the Grande on Sand Key to enjoy sunsets, serenity and new friends. For 16 years, Ellen Davis, his neighbor at the Grande, has been a good friend and constant companion. While at the Grande he also served as historian for the 20th Air Force, 6th Bomb Group. Three of his sons and his daughter with their spouses and Laurie, Bob’s wife, survive him along with 8 grandchildren and 12 great grandchildren. His son Bob George, an F-16 pilot and pilot for Delta Airlines preceded him in death. Arrangements are being handled by David C. Gross Funeral Homes. www.DavidCGross.com located at 830 N. Belcher Road, Clearwater, FL 33765 (727) 446-2222. Services will be held graveside on June 25th at 10am at Calvary Catholic Cemetery, followed by a Celebration of Life at “The Grande“ Sand Key, 1170 Gulf Blvd. Clearwater Beach, FL.immediately following the graveside service. To those of you who may be attending the military funeral service and celebration reception for Harry, the family is inviting you to wear smart casual attire instead of coats, jackets, ties, etc. in light of the celebration of his life as well as the June heat. He would want everyone comfortable and he so enjoyed wearing his hat and tropical shirts. Feel free to join us. We thank everyone for their kind thoughts and prayers and look forward to seeing you on Saturday.